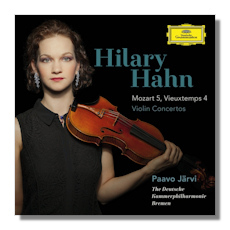 This is a terrific disc, as most of Hillary Hahn's unusual and thoughtfully considered concerto collaborations are. With the outstanding Paavo Järvi and his Bremen forces in tow, Hahn proves that she's still one of the finer players today. It's both sobering and heartening to realize that Hahn is now in her 30s, has been doing this since her teen years, and could conceivably give us two or three more decades of recorded excellence. The Mozart is absolutely stunning. There are so many ways to play this music well, and Hahn has a real sense of Classical elegance. So too do her partners, who really brought this music to life for me. There is a poise and grace that is very attractive, as is Hahn's lightly dancing yet supremely assured technique. Too often the orchestra lets the soloist down, but Paavo Järvi's intelligent pacing and insistence on rhythmic accuracy makes sure that doesn't happen. Listening straight through, perhaps what impresses most is the natural way in which the music unfolds. Hahn and the orchestra are remarkable, but what strikes me is the way in which the performance consistently satisfies without drawing too much attention to itself. The Vieuxtemps is equally thrilling. No one since Heifetz has really given these wonderful works attention. Järvi begins the work with a richly dramatic accompaniment, and shows off the tonal versatility of his orchestra. If they were a small, crisply emphatic chamber group for the Mozart, here they take on a more foreboding and Romantic character. The effect is totally convincing and gives Hahn the ideal support she requires to make this music work. The Finale is particularly satisfying, with its mix of folksy charm and devilish effects. I hope she'll tackle the Belgian's other concertos at some point, and the same applies to those remaining four of Mozart. Still full of youth and boundless potential, Hillary Hahn will hopefully continue to provide us with innovative projects like these in the years ahead.